Our home is a work in progress. Actually, my whole life is a work in progress! Ha! Big projects in the house aren't in the works right now since work on the greenhouse is still continuing. Here it is in it's half painted stage. Yes, it really is green! Small projects are all we can handle in the house right now. One of those projects was tackling the lack of towel bars in our main bathroom. We haven't done much in the bathroom except pull out the dropped ceiling and add a few lights. For a temporary fix, I added a quilt rack to hold our towels. I felt like it was always getting in the way and tended to be top heavy when holding wet towels. I picked up some hooks from Hobby Lobby (when they were 50% off) and hubs attached them to some leftover 1 by 4s. Then the wood was attached to the wall studs for stability. The wood was already stained to protect it - but not the right shade. No worries, it will be fixed in the next year when we remodel the whole bathroom. In the meantime, it is very functional. Couldn't help but fall in love with this sunflower in my garden last month. The older grandfellas helped me harvest the last of the tomatoes and peppers before the first cold snap of autumn. Goodbye summer, thank you for your warm, sunny days. 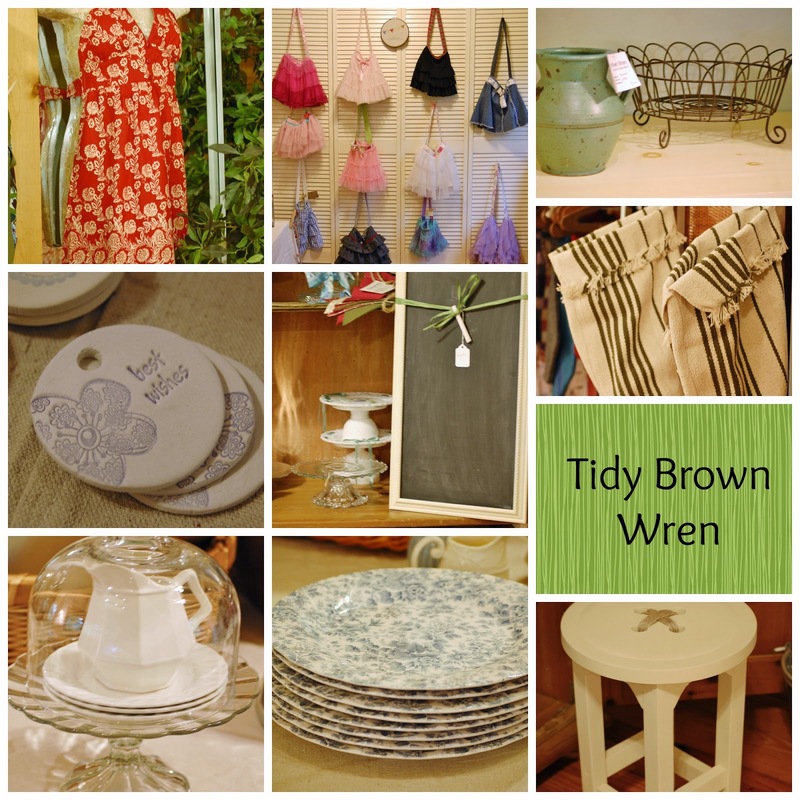 I'm getting ready for Tidy Brown Wren's Spring Open House. If you missed the Fall Open House, you'll want to make sure that you make it to this one. Most items are one-of-a-kind, so you'll want to arrive early to get your favorite piece. Most of the time, when I'm called in to help stage or organize a home, I encounter an overstuffed master bedroom. What I mean by overstuffed is too much furniture, too many clothes, and too many items that don't belong in a bedroom. A lot of people, including myself, tend to put stuff in the bedroom that doesn't belong because we don't know what else to do with it. It becomes a staging area for projects, laundry, exercise equipment, and "stuff". 1. What do I want this room to feel like? Restful retreat, romantic getaway, or an inspired haven? 2. What pieces of furniture could be gotten rid of? Bookshelves, dressers, chairs, exercise equipment? 3. What items end up in your bedroom that don't belong there? Toys, paperwork, laundry? 4. Are there any repairs that need to be made? Loose handles, broken curtain rods, stuck door? 5. What activities will take place in the bedroom? Reading, bill paying, television watching. After you have wrapped your brain around what you want your bedroom to be like, it's time to get to work. I like to make the bed first. Somehow that one little job makes the room 25% better. 1. Remove all furniture, exercise equipment etc. that does not belong in the room. 2. Collect all clothes that are laying around and put them into a large pile or clear garbage bag (Make it a clear one so you don't accidentally throw it away or donate it). You'll work on clothing later. 3. Clear off each dresser and bedside table (basically every horizontal surface). placed in a bag for donate, a bag for trash, or a box to be taken elsewhere in the house. Don't mess with the inside of the drawers yet - you'll do that later. 4. Clean and polish every surface. Pull out the furniture and vacuum the floors and clean the baseboards. Also, clean the backs of all of the furniture. Take down the drapes and clean or replace them. Wash the windows and window sills. 5. Place all of the stuff you collected from the horizontal surfaces (that you want to keep) and put it back onto the newly cleaned dressers, bedside tables, desk etc. 6. Now that your bed is clear, it's time to work on the clothing. a. Pull out your pile or bag of clothing that you collected from around the room. b. Working with only one person's clothing at a time, sort the clothing into piles of types of clothing (pants, shirts, dresses, etc.). c. Open your dresser (or whatever you keep your clothing in), pull out the clothing, and sort it as before. Continue this process with your closet if you have the room. If you have tons of clothing, just do your dresser first and then your closet. d. Take one sorted pile at a time and go through it. Ask yourself "Do I love it". "Do I wear it"? "Does it make me feel good when I wear it?'' "Is it worth the space it takes up in my bedroom?" "How many of these same items do I need?" e. Only allow clothing that you decide is a keeper to make it's way back into your dresser. Put all of the clothing back, keeping like items together. f. Continue with all of the piles until all of your clothing is put away. 8. Remove all trash and throw it away. Put all clothing donations in the car so you can drop it off tomorrow at the thrift store. 9. Light a candle in your room and relax. Your hard work has paid off! How to clean and organize your bathroom and keep it that way. So, if you're following along with me in the process of organizing and cleaning your entire house this year, we'll be working on the bathroom in February together. Well, not really together. I mean you work on your bathroom and I'll work on mine. I thought I would use some photos of bathrooms I've staged for my clients over the past year or two. One of the things you will notice about all of these bathrooms is that I use all white linens and light colored accessories. You'll want to work on only one bathroom in your home at a time. As usual, you'll want to check out each bathroom and do an assessment. Check out this post for the details. Staged bathroom in a home for sale. After you've done an assessment of the bathroom it's time to roll up your sleeves and get to work. 1. Remove everything from the cabinet or drawer. Wipe out the cabinet/drawer and line with contact paper if desired. 2. Toss everything that is expired or unusable. 3. Sort items according to type. Example: hair products, face products, first aid products. 4. You may find that you have several duplicates. A lot of people tend to not finish up products before they open a new one. Consolidate the duplicates and promise yourself to finish up a product before breaking out the new replacement. 5. Now that you know what you have and will use, put items into containers to keep them organized and easy to find. Shop your house first to see if you have containers you're not using in other areas. There's no need to spend money if you don't need to. Square and rectangle containers are the best as they use space more efficiently. If you need storage for small items, use a drawer unit to sit inside the cabinet. 6. Store items you don't use often or only seasonally in the back of the cabinet or in an out of the way closet. Keep your most often used items near the front of the cabinet. Before storing paper products under your sink, make sure you don't have any leaks. Paper plus water equals mess!! 7. Hopefully, you'll have a trash bag full of trash and a bag of donations to remove from the bathroom. So how do I keep my bathrooms clean? 1. I make my own bathroom cleaner and spend 10 minutes every other day doing a quick wipe up of the sinks, counters, and toilet. If you have small children you might need to do it every day. If you're neater and cleaner than I am, you can get by with twice a week. 2. Once a week, I wash all of the towels (unless they need it sooner) and 2 or 3 times a year I wash the shower curtain and bath mats. I also vacuum and mop the floor when cleaning the rest of the house each week. 3. Now, I'm about to share one of my secret efficiency tips. Every 6-8 weeks I color my own hair. While the color is sitting on my hair (25-30 minutes), I tidy up the cabinets and drawers, getting rid of anything we don't need any more. No one wants to be near me with stinky stuff on my hair so I'm left to clean without any interruptions! 4. Once a year, I vacuum the exhaust vent. So, now you have a plan to help you clean and organize your bathroom and keep it that way. Go forth and conquer! Organizing your home in 2015-Start at the front door. So. . . you've set a New Year's resolution to organize and deep clean your house this year. Sure, sure - you said that same thing last year, but this year you really mean it. But now it's almost the end of January and you don't know where to start. I'll be blogging each month about an area to work on . We'll take one area per month. Don't try to do more than that one area a month and overwhelm yourself because you'll want to quit. And quitters never have clean homes! In January, you should work on the area where you enter your home. Front door? Back door? It doesn't matter. We'll just call it your home's entrance. 1. Evaluate what you need in the area. Think through your daily routine of entering and exiting. Think about what you need to help your family get what they need and keep it organized. Coat hooks? Shoe racks? Key storage? Think also about new paint, a bench, or a new rug. If you don't have a coat closet to hold your things, you can use ready made coat racks and shoe cubbies. But here's the important thing - Don't buy anything yet!! Just think about what you might want to get or do. 2. Step two is the most important step. Touch everything in that entrance area. Pick it up and make a decision about where it belongs. If it doesn't belong in the entrance area, set it aside. If it's trash, put it in a black trash bag. If it needs to be donated, put it in a clear trash bag. If it belongs somewhere else in the house, put it in a large box or basket to empty out later. After you have made a decision about everything, put the trash in the trashcan and the donation bag in your car so you can drop it off to a charity. Set the basket of items to be relocated outside of the room - don't put anything away yet. The more clutter you have, the harder it is to keep organized. Set all of these carefully chosen things aside. You'll put them away later. 3. Now for the elbow grease. Clean every surface. Start at the top, whether it's a closet or a wall. Wipe down walls, shelves, and cabinets. Finish with the floor. If you need to make repairs, paint, or replace light bulbs, do it now. 4. Ahh. . . now you have a clean and fresh area to furnish. Whether you have a closet, a hall, or a wall, decide what storage items will help you store what you need. If your family is still growing, you'll want to take that into account. Use what you already have or purchase new or thrifted items for storage. 5. As you put your belongings away, keep like items together. Put all of the gloves and hats together, all of the shoes together, etc. Put items close to where you use them such as shoes close to the floor, kid's coats on a lower hook or bar to be easier to reach, etc. 6. Now you can step back and enjoy your hard work. Grab the box of items that belong somewhere else and put them away. 7. Now for the second most important important step - maintenance. Every week, tidy up the area by straightening everything and putting everything away. Every January, go through the area and decide what items are no longer needed. I recovered a chair for my son's apartment a few months ago and I'm eager to show you the before and after photos. This was the chair that we've had in our bedroom for at least 20 years. My father in law originally got it from one of his older neighbors. It was very sturdy, but very out dated and stained - and pink. I took the cushions off of the chair and removed all of the old fabric. The cushions were still in good shape. Then I spray painted the frame with Oil Rubbed Bronze paint. After that, I stapled the new fabric (left over from a previous project) onto the cushion forms. I needed to cover up some of the staples on the back of the chair but I didn't want to purchase anything. Thankfully, I always save extra strings, ribbons, and trim. Out of my basket of trim, came a wide brown shoe lace. Perfect! Not bad for using supplies I already had on hand. I made a pillow to go with it - again, using extra fabric, trim, and pillow stuffing. The cross pieces are made from a khaki colored belt. My son appreciates the extra seating in his living room and was happy that I didn't make the chair too "girly".